Cinema and theatre, opened April 1954. Named in honour of the Portuguese composer, Aves Coelho (1882-1931). 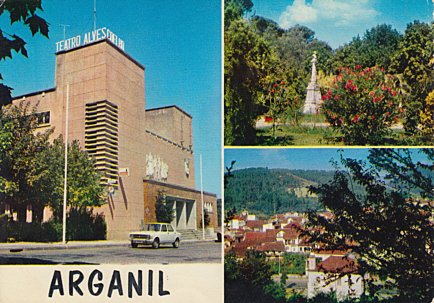 Picture: left: "Teatro Alves Coelho"
Front Text: "Arganil", sign: "Teatro Alves Coelho"
Reverse Text: "Vale do Alva, Arganil, Portugal - Aspectos da Vila, Aspects de la ville, View of the town"